Lost in the Tents at Fashion Week Paris! 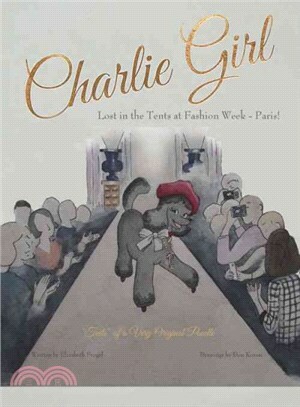 The fourth book in this delightful series is set in Paris during fashion week, starring, Charlie Girl and her canine pals traveling from America to Paris with Mom for the fashion shows. The real adventure begins when Mom leaves her keys behind and Charlie and her friends make it their job to get the hotel keys to Mom straight away. As they make their way through Paris, enjoying the famous sights along the way, they end up on the fashion runway causing quite a stir, and strutting their stuff, as they find Mom sitting in the front row at the fashion show. And rest assured, the French cuisine is not lost on Charlie and her pals. Children and adults alike will enjoy the Parisian sights, the endearing humor always found with Charlie Girl, and the beautiful watercolor renderings. Charlie Girl donates $1 for her every book sold in the series, to the ASPCA. Please know when you purchase and enjoy reading a Charlie Girl book, you are partnering with Charlie to help animals in need. Elizabeth Frogel, Charlie Girl’s mom, lives in New York City with her daughter, Ava, and their favorite poodle and best friend, Charlie Girl. This series, inspired by their real-life love affair with the mischief-making Charlie and the inspiring moments that happen every day, is a tribute to dog lovers and their “best friends” everywhere. Elizabeth, a former interior designer and the founder of CenturyMom, a successful New York City-based fashion consignment business, has channeled her creativity and fashion sense into creating a delightful series of children’s books that, because of their unique, high quality design elements, are truly collectibles.